This year you helped us raise more than $125,000 for Special Olympics athletes in Kentucky and Ohio. contact Taylor Ballinger at 502-695-8222 or tballinger@soky.org. The team from first-year Presenting Sponsor Kona Ice happily led off the Plunge. 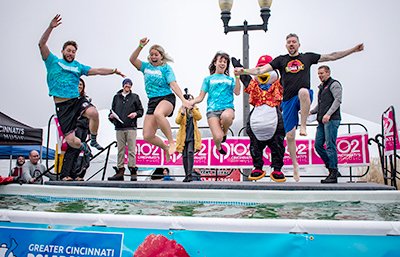 The Grater Cincinnati Polar Plunge is the Chill of a Lifetime! Join us for the Polar Plunge for Special Olympics. Raise a minumum of $75 (or $50 for Polar Bears under 18) and take a chilly dip into a pool that will be set up in the Joe’s Crab Shack parking lot. Prizes for the top individual fundraiser and for the top fundraising teams in corporate/civic, school and law enforcement divisions. There are also prizes for the best individual and group costumes. Can’t plunge, but still want to support Special Olympics? No problem. Register as a Virtual Plunger. You get a Polar Plunge shirt and are eligible for all other fundraising awards. 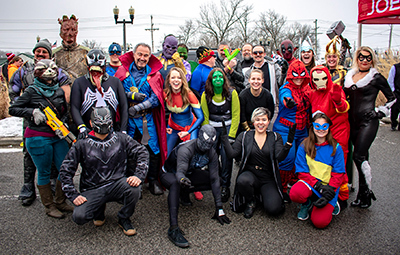 Terracon won their third straight costume contest Golden Plunger by recreating Avengers Infinity War. For more information or for sponsorship details, contact Taylor Ballinger at 800-633-7403 or 502-695-8222 or by e-mail at tballinger@soky.org or Amy O’Neal at 513-405-3450 or via e-mail at amykute@hotmail.com.